SOx but also particulate emissions,” he coming a large concern for owners, and, to consult and retro? t these technologies rarely cost-effective in a retro? t situation added. “EGCSA members have the ca- with additional deadlines approaching, with a strong focus on limiting the cost but that conversions to accommodate the pacity and resources to meet demand, for the existing ? eet this means retro? t and operational impact on owners.” use of LSMGO can generally be made market conditions are favorable and we and the consideration of possible com- One option is to modify vessels to with only minor modi? cations and sig- have had the green light from IMO for pliance solutions ranging from exhaust run on emissions-compliant fuel types ni? cantly less capital investment. These 2020. 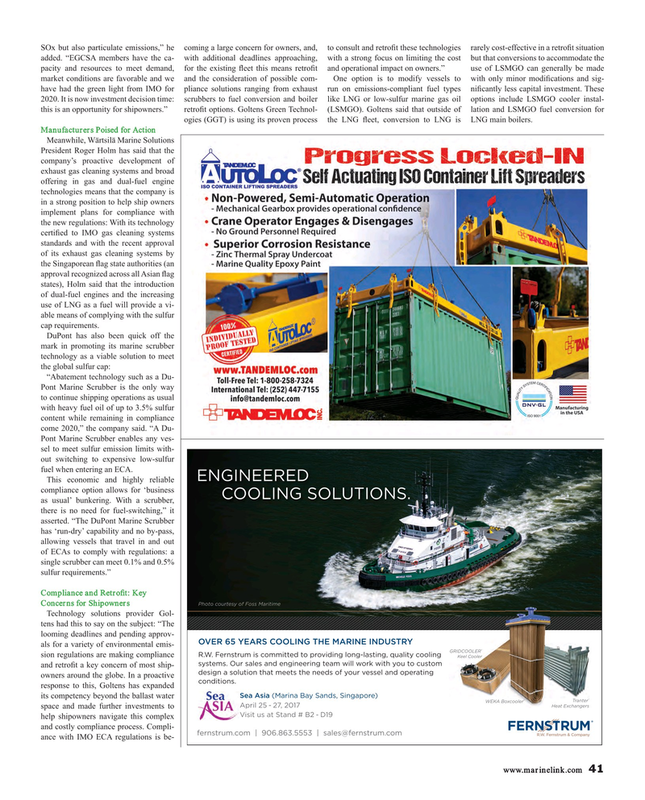 It is now investment decision time: scrubbers to fuel conversion and boiler like LNG or low-sulfur marine gas oil options include LSMGO cooler instal- this is an opportunity for shipowners.” retro? t options. Goltens Green Technol- (LSMGO). Goltens said that outside of lation and LSMGO fuel conversion for ogies (GGT) is using its proven process the LNG ? eet, conversion to LNG is LNG main boilers. President Roger Holm has said that the company’s proactive development of exhaust gas cleaning systems and broad offering in gas and dual-fuel engine technologies means that the company is in a strong position to help ship owners implement plans for compliance with the new regulations: With its technology certi? ed to IMO gas cleaning systems standards and with the recent approval of its exhaust gas cleaning systems by the Singaporean ? ag state authorities (an approval recognized across all Asian ? ag states), Holm said that the introduction of dual-fuel engines and the increasing use of LNG as a fuel will provide a vi- able means of complying with the sulfur cap requirements. Pont Marine Scrubber enables any ves- sel to meet sulfur emission limits with- out switching to expensive low-sulfur fuel when entering an ECA. This economic and highly reliable compliance option allows for ‘business COOLING SOLUTIONS. Keel Cooler systems. Our sales and engineering team will work with you to custom and retro? t a key concern of most ship- design a solution that meets the needs of your vessel and operating owners around the globe. In a proactive conditions.